It’s my favorite time of year! I love the Christmas holidays. Why? Because I get to make people some of my baked goodies. And I absolutely love doing this and then handing them over. I do this for the people at my bank…the gas station…my neighbors…my adoptive family…and my apartment office. I do it for friends and family. I just love, love, love, love to create something in my kitchen and then bring a little joy and sweetness to the people in my life. Well, as my roommate and I have made friends with our new downstairs neighbors…we wanted to make some Christmas cookies for them. 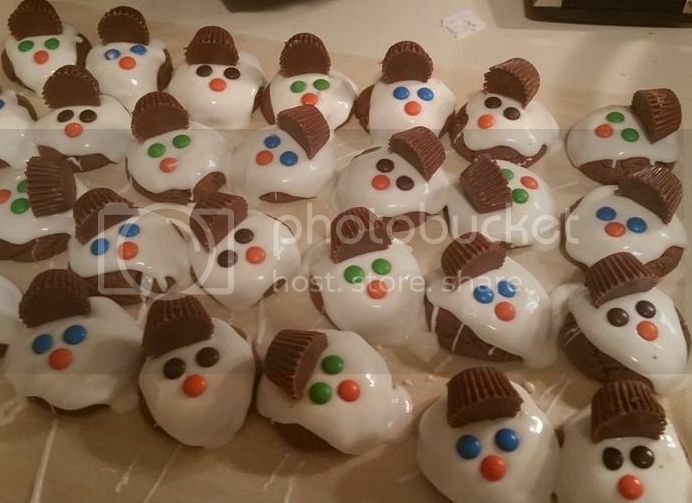 After asking if their young son had any food allergies (he doesn’t)…I went ahead with my plan to make these adorable Melted Snowman Cookies. I was just crossing my fingers the entire time that they would work out. They did. They require a little work when it comes to the faces…but totally worth it. In a large mixing bowl, beat shortening and peanut butter with an electric mixer on medium to high speed for 30 seconds. Beat in the granulated sugar, brown sugar, baking powder, salt, and baking soda until combined, scraping sides of bowl occasionally. Beat in egg, milk, and vanilla until combined. Beat in the cocoa powder and as much of the flour as you can with the mixer. Stir in any remaining flour. Shape dough into twenty 1-3/4-inch balls. Place balls 2 inches apart on ungreased cookie sheets.Bake for 9 to 11 minutes or until edges are just firm. Cool on cookie sheet for 2 minutes. Transfer to a wire rack and let cool. Line a baking sheet with waxed paper. Place cooled cookies on prepared baking sheet. In a medium microwave-safe bowl microwave candy coating on 50% power for 2-1/2 to 3 minutes or until melted and smooth, stirring every 30 seconds. Spoon melted coating over each cookie to cover cookie and resemble melted snow. While coating is still tacky, add a peanut butter cup for a top hat and decorate with mini M&Ms or other candies to resemble snowman faces. These cookies are not only adorable but they are amazing too! Lots of flavor. And they are so easy to make, but it looks like you spent hours in the kitchen making them. The difficult part is letting that candy coating cool so you can package them up. HA! If you are looking for a cute Christmas cookie idea…I highly recommend these! This entry was posted in Baked Goods, Chocolate, Cookies, Dessert, Dough, Flour, Gluten-Free, Recipe, Snacks, Sweet Stuff, Vegetarian by The Celiathlete. Bookmark the permalink.